Shepard likely will play most of his snaps outside in 2019, Scott Thompson of SportsNet New York reports. 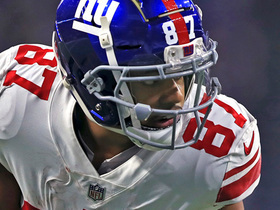 Shepard is primed for a larger role within the Giants offense after the team traded Odell Beckham (quad) to the Browns on Tuesday, Matt Lombardo of The Newark Star-Ledger reports. Shepard finished the season with 66 catches for 872 yards and four touchdowns on 107 targets. Analysis: Shepard was slightly disappointing given Odell Beckham's (quadriceps) late-season absence and Evan Engram missing time with a knee injury during the middle of the year, but the Eli Manning factor mitigates that. A solid route runner with average size and speed, Shepard should reprise his usual role as the No. 2 wideout behind Beckham in 2019. Better play under center could raise Shepard's fantasy ceiling. Shepard (hip) practiced in full Thursday. Shepard was a limited participant in Wednesday's practice due to a hip issue. Analysis: Shepard didn't show any sign of injury during Sunday's 28-27 loss to Indianapolis, catching six of seven passes for 113 yards while handling an 89 percent snap share. He may be looking at another week as the Giants' No. 1 wide receiver, as Odell Beckham (quadriceps) didn't take part in Wednesday's session. 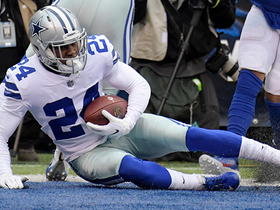 The Week 17 matchup looks tough on paper, but it won't all that difficult if the Cowboys rest some of their key players for at least a portion of the game. Shepard caught six of seven passes for 113 yards and lost three yards on a carry during Sunday's 28-27 loss to the Colts. Shepard is expected to serve as the Giants' No. 1 receiver in Sunday's game against the Colts with Odell Beckham (quadriceps) sidelined for the third straight week, Jordan Raanan of ESPN.com reports. Shepard will serve as the Giants' No. 1 wide receiver Sunday against the Titans in the absence of Odell Beckham (quadriceps), Michael Eisen of the team's official site reports. Analysis: After Beckham was ruled out Week 14 at Washington, Shepard led Giants wideouts with 43 (of 64) offensive snaps, which was followed by Corey Coleman's 42, Russell Shepard's 26, Benny Fowler's 26 and Jawill Davis' 26. While Shepard hauled in just two of six targets for 17 yards, one of his three looks in the red zone resulted in a touchdown. He'll attempt to do more Sunday against a Tennessee defense that has given up the sixth-most TDs (17) to wide receivers this season. 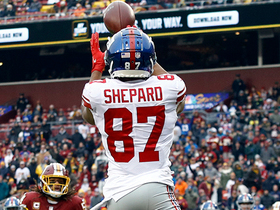 Shepard caught two of six targets for 17 yards and a touchdown in Sunday's 40-16 win over the Redskins. Analysis: Shepard led his team in targets with Odell Beckham sidelined by a quadriceps injury, but three other Giants finished with more receiving yards. Beckham will likely return against the Titans in Week 15, bumping Shepard back down to the No. 2 wide receiver role in New York. Shepard figures to see more targets after Odell Beckham (quadriceps) was surprisingly ruled out ahead of Sunday's contest against the Redskins. Analysis: It's been an inconsistent third season for Shepard to date, but the 24-year-old is poised for a major opportunity with the news that Beckham would not be available Sunday. Against a Redskins defense that has allowed the third-most fantasy points to the wide receiver position, Shepard figures to easily exceed 17.5 percent of the team targets -- his current average this season -- and should present a lucrative fantasy option for season-long and daily players alike. Shepard (ribs) was a full practice participant Thursday, Dan Duggan of The Athletic reports. Shepard (ribs) was a limited practice participant Wednesday, Art Stapleton of The Bergen Record reports. Analysis: The ability to practice in any capacity at the beginning of the week suggests Shepard has a good chance to play Sunday at Washington. He fought through the rib injury during last weekend's win over the Bears, returning to the game after an X-ray didn't reveal any fractures. Shepard has failed to reach 40 yards in five consecutive games, which included a four-catch, 34-yard showing on eight targets against Washington in Week 8. Shepard (ribs) received good news from X-rays and a CT scan, but he did say Monday that he's dealing with some pain, Art Stapleton of The Bergen Record reports. Shepard brought in four of six targets for 28 yards in the Giants' 30-27 overtime win over the Bears on Sunday. Shepard (ribs) returned to Sunday's game versus the Bears, Dan Duggan of The Athletic reports. Analysis: Shepard was seen favoring his side and lower back following a hit near the end of the first half. While he was deemed questionable to return due to a rib injury, he's back in search of his first catch of the contest. Shepard is questionable to return to Sunday's game against the Bears due to a rib injury, Paul Schwartz of the New York Post reports. Analysis: According to Pat Leonard of the New York Daily News, Shepard was seen favoring his side and lower back after Bears linebacker Roquan Smith landed on the wide receiver on his only target of the game prior to departing. If Shepard is unable to reenter the contest, the Giants will rely on Odell Beckham, Bennie Fowler and Russell Shepard at wide receiver. Shepard caught four of six targets for 37 yards during Sunday's 25-22 loss to the Eagles. Shepard brought in both of his targets for 22 yards in the Giants' 38-35 win over the Buccaneers on Sunday. Analysis: Shepard was quiet in the win, posting his second straight two-catch effort. The third-year pro only has 65 combined receiving yards over the last three games, a significant downturn after he'd notched between 75 and 167 yards in four of the five contests prior. Shepard will look to reclaim his normal target share after seeing only five looks over the last pair of games when the Giants face off with the Eagles in a Week 12 divisional showdown. Shepard caught two of his three targets for nine yards, but one of them was the game-winning touchdown against the 49ers on Monday night. He also had one carry for 27 yards. Analysis: The Giants are a low-octane offense with Eli Manning under center, and Odell Beckham and Saquon Barkley are the top priorities. Shepard and Evan Engram are next in line, but sometimes there's not enough to go around. Shepard caught four of eight targets for 34 yards during Sunday's 20-13 loss to the Redskins. Analysis: Shepard saw plenty of targets, but he hauled in just half the passes thrown his way and finished with one of his quietest performances of the season. His long reception went for 14 yards, and he was otherwise held to rather short gains. Perhaps Shepard's quiet outing has to do more with the opponent, but Evan Engram also reemerged as a large part of the passing game and could cut into Shepard's role moving forward. He'll be on bye next week before facing the 49ers in Week 10. Shepard caught five of eight targets for 167 yards in Monday night's 23-20 loss to the Falcons. 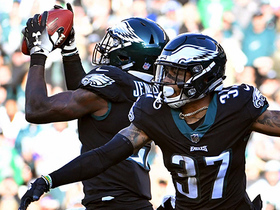 Shepard caught three of seven targets for 37 yards in Thursday's 34-13 loss to the Eagles. Analysis: The Giants passing game struggled all game, and Shepard's production suffered as a result. Making matters worse for Shepard, Evan Engram could be back next week, providing another key mouth to feed. Shepard caught four of seven targets for 75 yards during Sunday's 33-31 loss to the Panthers. Analysis: Shepard finished second on the team in targets, finishing behind only Odell Beckham Jr. and Saquon Barkley in receiving yardage. He broke off a long gain of 28 yards and could have had a bigger day if not for a couple of misfires from Eli Manning. Shepard is now averaging 6.7 catches to go along with 77.3 receiving yards per game over his last three, and he'll look to continue his recent form Thursday against the Eagles. Shepard (back) doesn't carry a designation on the final injury report for Sunday's game at Carolina, Jordan Raanan of ESPN.com reports. Analysis: Shepard had a minor procedure earlier this week to remove a cyst from his lower back, but it didn't stop him from logging a full practice Thursday. With tight end Evan Engram (knee) ruled out for at least one more game, Shepard is the unquestioned No. 3 option in a top-heavy offense led by Saquon Barkley and Odell Beckham. Shepard took advantage of Engram's absence in last week's loss to the Saints, hauling in all 10 of his targets for 77 yards and a score. Shepard (lower back) was a full participant at Thursday's practice, Art Stapleton of The Bergen Record reports. Shepard (lower back) returned to practice Thursday, Jordan Raanan of ESPN.com reports. Analysis: In the wake of a procedure earlier this week to remove a cyst from his lower back, Shepard didn't take the practice field Wednesday, instead riding a stationary bike during the open part of practice. He was an active participant Thursday, though, as he ramps up his activity level for a Week 5 visit to Carolina. His workload will be confirmed when the Giants release an injury report Thursday afternoon. Coach Pat Shurmur said that Shepard would be withheld from practice Wednesday and perhaps Thursday after undergoing a minor procedure to remove a "little cyst" from his lower back, Paul Schwartz of the New York Post reports. Analysis: It seems Shepard's procedure was mostly cosmetic in nature, so as long as he returns to practice by Friday, his status for Sunday's game at Carolina won't be in much peril. Shepard saw his role expand in the Week 4 loss to New Orleans while tight end Evan Engram (knee) was sidelined, hauling in all of his season-high 10 targets for 77 yards and a touchdown. Shepard caught all 10 of his targets for 77 yards and a touchdown Sunday against the Saints. Analysis: Shepard drew the softer cornerback matchup and took advantage, though his longest catch was only 23 yards. 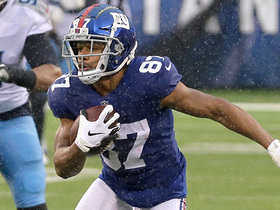 With tight end Evan Engram out, the Giants' receiving tree is narrow, and Shepard will continue to have a significant role. Shepard could see an uptick in targets while Evan Engram recovers from an MCL sprain, Jordan Raanan of ESPN.com reports. Shepard caught six of seven targets for 80 yards and a touchdown against the Texans on Sunday. 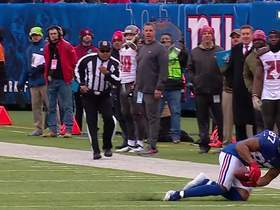 Analysis: With Evan Engram (knee) out, Shepard was Eli Manning's clear No. 2 read after Odell Beckham. While Shepard is not as explosive as Beckham, he's a reliable second wideout for Manning and could see a bigger target share if Engram misses more time. Shepard caught three of five targets for 24 yards Sunday against the Cowboys. Analysis: The Giants offense struggled all game, and Shepard never got going. He's still a key cog in the team's offensive system, Sunday night's game notwithstanding. Shepard (back) practiced in full Thursday. Analysis: Prior to the session, Shepard expressed optimism he'd be a full participant, per Art Stapleton of The Bergen Record. Shepard proceeded to do just that, clearing up any question about the back injury that limited him at Wednesday's practice. He'll now prepare in earnest for Sunday's road matchup against the Cowboys, who had the 11th-ranked pass defense a season ago. Shepard (back) said he anticipates being a full participant in Thursday's practice, Art Stapleton of The Bergen Record reports. Analysis: Shepard came out of the Giants' season-opening loss to the Jaguars with the back injury, which resulted in his reps being restricted in the team's first practice of Week 2. The wideout indicated that he feels better a day after the limited workload, so he should take all the snaps with the Giants' first-team offense during Thursday's session. Shepard appears in little danger of missing Sunday's game in Dallas. Shepard was limited in practice Wednesday due to a back injury. Analysis: Shepard's presence on the Giants' initial Week 2 injury report was forecast when he appeared to be a non-participant during the portion of practice open to the media, according to Ryan Dunleavy of NJ.com. In the end, Shepard was able to fit in enough reps to draw a limited tag Wednesday. After a sophomore season in which he missed five games, Shepard's status will be one to watch, given his standing as the clear No. 2 receiver behind Odell Beckham. Shepard caught five of seven targets for 48 yards Sunday against the Jaguars. Analysis: Odell Beckham saw 15 targets, but Shepard was the next most involved pass catcher on the team, something that's likely to be the case often this year. Shepard draws a considerably easier matchup Week 2 against the Cowboys. Shepard hauled in all seven targets for 78 yards during Friday's preseason game versus the Jets. Analysis: In the absence of Odell Beckham, Shepard was looked at early and often by Eli Manning in what amounted to a dress rehearsal for the Giants. Among the looks, three of them went for greater than 10 yards (13, 20 and 30) while three others were negligible (three, two and one yards). Shepard's workload will scale back slightly once Beckham is back in the fold, but this performance puts his preseason line at a healthy 10 catches (on 11 targets) for 117 yards and no touchdowns. 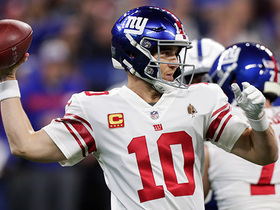 Giants quarterback Eli Manning expects Shepard to have a big season, Matt Lombardo of NJ.com reports. "I thought Sterling had a great camp during the spring," said Manning. "He's understanding the coverages, understanding the route combinations, he understands zone and man, and how to make little moves to get open against different techniques. I think he's primed for a big year. And I've been really impressed by his work ethic." Shepard (neck) looked healthy for Eli Manning's passing camp at Duke University, dunking a basketball with ease between workouts, Pat Leonard of the Daily News reports. Shepard (neck) has been ruled out for Sunday's game against the Redskins, Art Stapleton of The Bergen Record reports. Shepard (neck) did not take part in Friday's practice, Jordan Raanan of ESPN.com reports. Analysis: Shepard has not practiced at all this week as a result of the neck injury he suffered in Week 16, so his chances of playing in Week 17 are not good. The Giants will reveal Shepard's official status for their regular-season finale when Friday's practice comes to a close. Shepard (neck) didn't participate in practice Thursday. Analysis: Shepard was contained to an elliptical bike for the second straight session, which wasn't nearly enough activity to warrant an elevation to limited participant. If he achieves such standing Friday, at the very least, he'll up his odds to suit up Sunday versus the Redskins. Shepard (neck) didn't take part in team drills during the media-access portion of Thursday's practice and was instead working out on a bike, Dan Duggan of NJ.com reports. Analysis: Shepard did the same activity during Wednesday's practice and was listed as a non-participant, so it looks like he'll be in line for the same designation again Thursday. Back-to-back absences to begin the practice week don't portend well for Shepard's availability for the season finale against the Redskins, but the wideout's odds of suiting up Sunday would improve if he's able to put forth a limited or full showing at Friday's session. Shepard (neck) took part in stretching and worked out on a stationary bike Wednesday, but wasn't taking part in drills during the portion of practice made available to the media, Dan Duggan of NJ.com reports. Shepard suffered a neck injury in Sunday's loss to Arizona, ESPN.com reports. Analysis: Shepard totaled five receptions for 45 yards on eight targets before leaving the game. There's no indication at this point that the neck issue is of any significant concern, but with a meaningless Week 17 game ahead, Shepard is the sort of player who might get scratched if the ailment is even a slight worry at that point. His practice activity is worth monitoring this coming week. Shepard (hamstring) reeled in 11 of 16 passes for 139 yards and a touchdown during Sunday's 34-29 loss to Philadelphia. Shepard (hamstring) doesn't carry a designation on the Giants' final injury report for Sunday's game against the Eagles. Shepard was limited in practice Thursday due to a hamstring injury, Jordan Raanan of ESPN.com reports. Shepard caught two of three targets for 16 yards during Sunday's 30-10 loss to the Cowboys. Shepard (hamstring) is active for Sunday's game against the Cowboys. Though Shepard (hamstring) is officially listed as questionable for Sunday's game against the Cowboys, Jordan Raanan of ESPN.com reports that the wideout told him he was running at full speed this week and didn't experience any issues with his hamstring during Friday's practice. Shepard (hamstring), who is listed as questionable for Sunday's game against the Cowboys, appears unlikely to play in the contest, Ian Rapoport of NFL Network reports. Shepard (hamstring) is listed as questionable for Sunday's game against the Cowboys. Analysis: Practicing both Thursday and Friday, Shepard appears poised to play through a hamstring issue. If active Week 14, he'll serve as a top option for quarterback Eli Manning versus a Dallas defense that has allowed two touchdowns to wideouts in each of the last three games. Shepard (hamstring) took part in Friday's practice, Jordan Raanan of ESPN.com reports. Analysis: It won't be clear until practice concludes how much work Shepard was able to get in, but he was on the field for the second straight day after sitting out Wednesday, which bodes well for his chances of playing in Week 14 against the Cowboys. The Giants will release an official update on Shepard's status at some point Friday. Shepard (hamstring) practiced in a limited capacity Thursday, Jordan Raanan of ESPN.com reports. Shepard (hamstring) was on the field for the start of the Giants' practice Thursday, Dan Duggan of NJ.com reports. Shepard isn't practicing Wednesday due to a hamstring injury, Dan Graziano of ESPN.com reports. 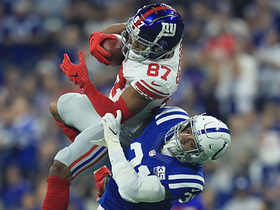 Analysis: Shepard's status will be monitored as the week rolls along, but assuming the hamstring issue is nothing major, the wideout's fantasy prospects for the Week 14 matchup with the Cowboys will be bolstered by the reinstatement of Eli Manning as the Giants' starting quarterback. The last time the duo was on the field together in a Week 10 loss to the 49ers, Shepard hauled in 11 of 13 targets for 142 yards. Shepard caught three of six pass attempts for 56 yards in Sunday's 24-17 loss to the Raiders. Analysis: Despite having missed the last two weeks due to migraines and a new man under center, Shepard was third on the team in targets. Though he had only managed nine yards on two catches until the fourth quarter, he salvaged his fantasy day by connecting with Geno Smith on a 47-yarder. Assuming his symptoms don't return, the former Sooner has a favorable matchup Week 14 versus Dallas. Shepard (illness) said he's made a full recovery from the unusually strong bout of migraines that caused him to miss the past two games, Ralph Vacchiano of SportsNet New York reports. Shepard (illness) practiced in full Wednesday, Art Stapleton of The Bergen Record reports. Analysis: Notably absent the past two games due to a migraine, Shepard's ability to handle every rep Wednesday forecasts a return to action Sunday in Oakland. When Shepard does return, he'll be working with a different signal caller due to Eli Manning's demotion to the backup role. With Geno Smith now under center and rookie Davis Webb expected to get an opportunity to direct the offense at some point over the final five games, Shepard's potential from week to week takes a significant hit. Shepard (illness) has officially been ruled out for the Giants' Thanksgiving game against the Redskins. Analysis: Shepard practiced in a limited fashion Monday, which was cause for optimism, but was unable to participate the rest of the week. Thus, his absence for Thursday's game is unsurprising. It will mark his second consecutive game missed due to migraines. Wide receivers Roger Lewis, Tavarres King and Travis Rudolph figure to see increased targets as a result. Shepard (illness) isn't expected to play Thursday at Washington, Adam Schefter of ESPN reports. Analysis: Shepard was tabbed with a "limited" designation on Monday's estimated injury report, but the positive start was followed by no activity at Tuesday's light practice and a DNP on Wednesday. With migraines still in tow, he's seemingly slated for a second consecutive absence. In such a scenario, wide receivers Roger Lewis, Tavarres King and Travis Rudolph should all have ample target counts by game's end. Shepard (illness) is listed as questionable for Thursday's game at Washington, Jordan Raanan of ESPN.com reports. Shepard (illness) doesn't appear likely to suit up Thursday against the Redskins, Paul Schwartz of the New York Post reports. "Sterling is not feeling well," Giants head coach Ben McAdoo said Tuesday. "We kept him in the training room [during practice] and the [Giants medical staff is] taking a look at him. They're looking at all the possibilities." The Giants officially listed Shepard as a non-participant in Tuesday's practice, Jordan Raanan of ESPN.com reports. Shepard (illness) wasn't present for the portion of Tuesday's practice that was open to the media, Dan Duggan of NJ.com reports. Analysis: With Shepard absent, it's likely that the wideout will be listed as a non-participant in Tuesday's practice after being considered limited Monday. With the Giants on a short week, Shepard's status for Thursday's game against the Redskins remains in peril, but his participation in the team's final practice Wednesday should provide more insight into his recovery from a migraine. Shepard (illness) was listed as a limited participant on Monday's injury report, Art Stapleton of The Bergen Record reports. Analysis: The Giants didn't actually hold a practice, but they're guessing that Shepard would've participated in some capacity if they had done so. He was held out of Sunday's 12-9 win over the Chiefs due to migraines that cropped up Saturday. It won't be a surprise if he's back for Thursday's game against Washington, but the situation likely will need to be monitored up until inactive lists are released approximately 90 minutes prior to the 8:30 p.m. ET kickoff on Thanksgiving. Shepard (illness) is inactive for Sunday's Week 11 tilt against the Chiefs. Shepard is unlikely to play Sunday against Kansas City due to an illness, but he will be evaluated during pregame warmups, Adam Schefter of ESPN reports. Analysis: Shepard was a full participant in practice all week, but was added to the injury report Saturday after coming down with the illness. Roger Lewis and Tavarres King would presumably benefit in targets should Shepard ultimately sit out, while Evan Engram could see even more looks at tight end. Shepard has been added to the Giants' injury report for Sunday's game against the Chiefs due to an illness. Analysis: Shepard was a full participant at practice throughout the week, so the illness he is suffering from must have just came on. Due to a plethora of injures at wide receiver this season Shepard has emerged as the Giants' No. 1 threat at the position. He hauled in a season high 11 receptions for 142-yards last week against the 49ers. Roger Lewis and Tavarres King would presumably benefit in targets should Shepard ultimately sit out, while Evan Engram could see even more looks at tight end. Shepard caught 11 of 13 targets for 142 yards during Sunday's 31-21 loss to the 49ers. Shepard caught five of nine targets for 70 yards in Sunday's 51-17 loss to the Rams. Analysis: Shepard returned after a three-week absence to lead the team in receptions while tying for first in receiving yards. Injuries have severely depleted the receiving corps, so the second-year pro will see a significant opportunity to serve as the team's top wideout moving forward. Shepard's fantasy value is trending upward at the moment and should continue to do so next week in a more favorable matchup against the 49ers. Shepard (ankle) was a full practice participant Thursday, Art Stapleton of The Bergen Record reports. Analysis: The development backs up Shepard's assessment from Wednesday, when he told Jordan Raanan of ESPN.com, "I'm straight this time." With his health not in question, Shepard is slated to make his first appearance since Week 5. In a receiving corps sans Odell Beckham (ankle) and Brandon Marshall (ankle), Shepard will be the No. 1 wideout. However, the emergence of rookie tight end Evan Engram may make Shepard the second option in the Giants' passing attack. Shepard (ankle) indicated that he fully expects to suit up Sunday against the Rams, Jordan Raanan of ESPN.com reports. Shepard (ankle) was a limited participant in practice Wednesday. Analysis: Shepard appears to be dealing with some residual effects of the ankle sprain he sustained in Week 5, which resulted in two absences before the Giants' recent bye. No matter, there's an expectation he'll return to action Sunday versus the Rams, which would receive credence with a full practice by week's end. If he's cleared to return, Shepard would vie with rookie tight end Evan Engram as Eli Manning's most-frequent read in the passing game. NFL Network's Mike Garafolo explains why the New York Giants gave wide receiver Sterling Shepard a 4-year, $41-million extension. New York Giants quarterback Eli Manning tosses a red-zone interception on the opening drive. 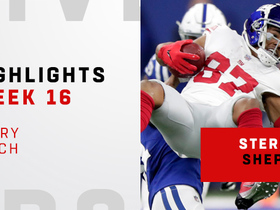 Watch every catch from New York Giants wide receiver Sterling Shepard's catch 113-yard day in Week 16 against the Indianapolis Colts. New York Giants quarterback Eli Manning delivers a strong pass to wide receiver Sterling Shepard for 20 yards. 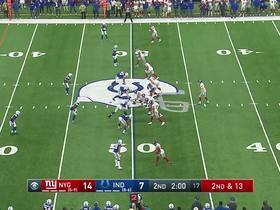 New York Giants quarterback Eli Manning unloads this 55-yard deep pass to wide receiver Sterling Shepard for a massive gain. New York Giants wide receiver Sterling Shepard goes airborne on this 17-yard pass. 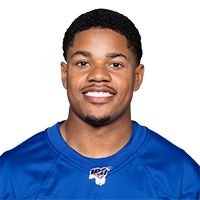 New York Giants wide receiver Sterling Shepard gets free for a 38-yard catch. New York Giants wide receiver Sterling Shepard gets behind the defense for a red-zone touchdown. Philadelphia Eagles safety Malcolm Jenkins intercepts New York Giants quarterback Eli Manning before halftime. New York Giants quarterback Eli Manning delivers a pin-point pass to wide receiver Sterling Shepard on third down.